Much controversy has been made about this movie within the past few weeks due in part to the email leaks from Sony Pictures. When I first heard about this movie, I was interested mainly because its been awhile since we had a movie that openly mocked a foreign leader in a comedic capacity. The last movie in my recollection that did it was Team America World Police with Kim Jong-Il and the Hot Shot series back in the 90's where they parodied Sadam Hussein who was the President of Iraq. Upon watching the first trailer my interest level was still there. 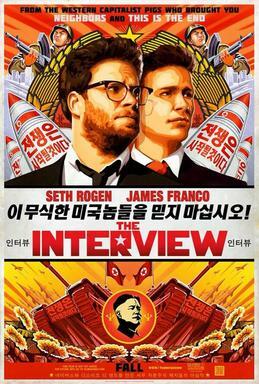 It had an amusing premise and the usual Rogen/Franco funny shenanigans which is a recipe for success. But alas we had unknown hackers that put a stop on the movie being released which unknowingly started getting people interested in the movie more than usual. Long story short after much begging and pleading and also President Obama embarrassing the company, Sony Pictures decided to release the movie on On Demand and in a limited theater engagement. So is the movie worthy of the hype that everyone is making it out to be? The answer is a resounding 'No'. What we have is a moderately funny and entertaining movie that could have been better than the sum of its parts. The premise goes as follows. Dave Skylark (played by James Franco) is a talk show host for a show called 'Skylark Tonight' where he interviews celebs on controversial topics. There's a very funny scene at the beginning where he's interviewing Eminem that gives you a very good idea of what the character is about. Skylark's close friend, Aaron (played by Seth Rogen) more or less runs the show behind the scenes arranging the various celeb interviews. The Aaron character enjoys the job but also wants to do serious stuff as well and not the fluff celebrity topics. After celebrating the anniversary of Skylark's show, Dave tells Aaron that Kim Jong-Un loves the show (through an article in a magazine) which prompts Aaron to contact North Korea to arrange an interview. The CIA catches wind of this and wants Dave and Aaron to assassinate the foreign leader. The remainder of the movie is essentially all the shenanigans that Aaron and Dave encounter when they arrive to North Korea. Kim Jong-Un (played by Randall Park) is played up as a very silly person. Its very funny at times especially since at one point him and Dave have a very buddy buddy relationship where they're playing basketball, having dinner, Kim showing Dave his military toys and even partying hard with multiple women. The jokes do fall flat when Franco gets a bit too silly in the role. Rogen more or less plays the straight man throughout the movie. He gets the jokes off and they're funny. Nothing more to it than that. At the end of the day, the movie is worth a rental. It isn't horrible by any stretch but its definitely the weakest comedy in Rogen and Franco catalog. Posted on December 26, 2014 by Dee the Black Geek.